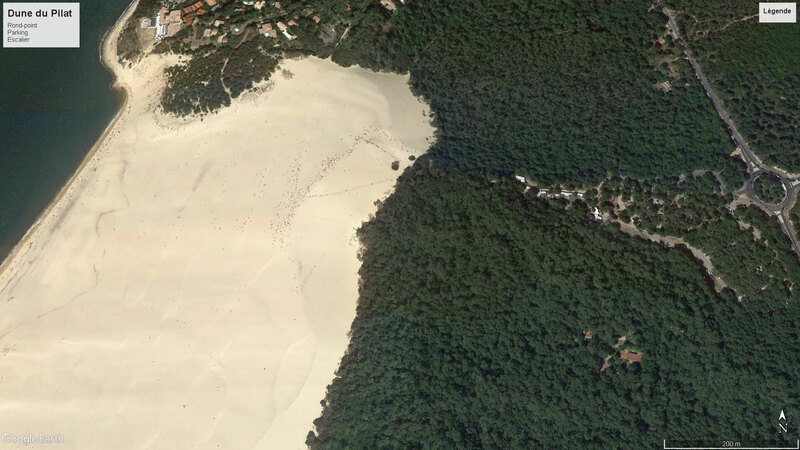 Visiting of the Dune du Pilat is free, but there is a charge for parking (see below). 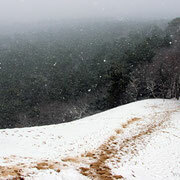 The visit can be made all year round and there are no schedules. There are no marked paths to follow either. You are free to discover the dune as you wish. Well, that's up to you! You can spend hours on the dune. Even if at the entrance of the car park, it is indicated that 30 minutes of parking are "free", allow more time for your walk. 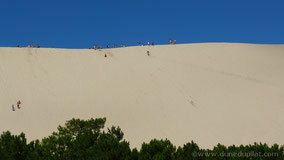 In fact, it is not possible to visit the dune in half an hour! If you stay 31 minutes, you pay as much as for 2 hours. So take your time to stroll along the dune ridge, to go down to the beach (but don't forget that you have to go up again!) 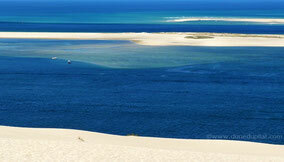 or to rest on the dune while enjoying the spectacular panorama. 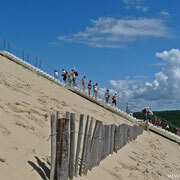 Due to the onrush of tourists, especially in summer, to Arcachon and the Dune du Pilat, there may be traffic jams. Please allow enough time for your visit! 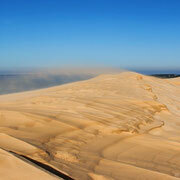 Visiting the dune in winter? Follow the weather forecast to find out what's waiting for you. 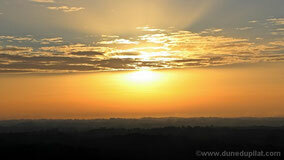 Choose, if possible, a day with sunshine and blue sky, so that you can really the place with its wonderful colours. There is a car park available for visitors. The main car park (parking charge) is just at the roundabout near the dune. It is also equipped for coaches and there is enough place for 950 cars. There is a fine of 50€ in case of using the car park between 2am and 5am! 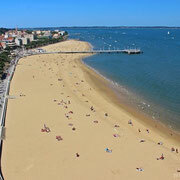 (To find parking spaces, take the Dune du Pilat roundabout in the direction of Arcachon and turn left at the next roundabout towards "La Corniche". After a few hundred meters, you will find free spaces. But beware: the access to the dune is longer and especially in high season, it's almost impossible to find a place here! Near the main car park there are some souvenir shops as well as bars and restaurants. In low season, some of them are closed. There are also public restrooms. Between the car park and the dune, there are also some information panels ("exhibition") with useful information about the Dune du Pilat (in French and English). If you came by car, you may have noticed the "original" spelling of the dune. So they say Pilat or Pyla? The answer is here.